Live Music, Theatre, Dance, Visual Art! Ticket Alternative and the staff could not survive without the arts and not from a financial stand point, but because we love it! The arts and the creativity are a part of our personal lives. There’s not a day that goes by where we aren’t discussing some concert or an amazing theatrical performance. Half the time, I’m not sure any of us would have something to say if it weren’t for the massive amounts of events that we attend. So we appreciate organizations like The Goat Farm Arts Center or companies like Bang! Arts. One organization that really drives a community to become involved in the arts is the Oconee Performing Arts Center, at Lake Oconee in Eatonton, GA and in Greensboro, GA. Formed in 2007, OPAS is a nonprofit cultural arts organization which brings top quality live music, theatre, and dance performances to the Lake Oconee region, an area possessing unparalleled natural beauty, antebellum treasures, scenic lake and golf resources, easy travel accessibility, and a diverse population that hails from around the globe. Education and outreach programs complement each season, reaching thousands of young students annually through Concerts in the Schools. OPAS brought the magic of the performing arts to local students, who were thrilled with their first introductions to Broadway stars, concert pianists, opera singers, dancers, orchestras, composers, arrangers, and music from a wide variety of cultures and styles. 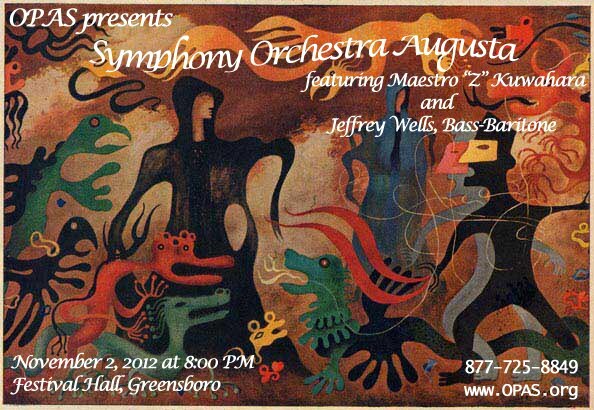 Maestro Shizuo Z Kuwahara and SOA return to Festival Hall in downtown Greensboro with New York Metropolitan Opera and interanationally acclaimed bass-baritone, Jeffrey Wells. He lends his dark allure to pieces from Floyd and Berlioz. Encounter Berlioz’s Faust as he endures a date with fate in Symphonie fantastique. This is a show you will not want to miss! Under the direction of Nashville’s very own arranger, composer and conductor, Jim Gray, OPAS will present A Family Holiday Celebration. Starring Mandy Barnett, an extraordinary ballad singer recognized across the world for her rich velvet voice and “Voices of Lee,” a 14-voice a cappella group, finalist on the NBC show “Sing Off.” In addition, you will hear an awesome 10-piece band hand-picked by Jim Gray, especially for this event. This will be a show for all ages, so bring the entire family to this wonderful holiday celebration.